We had lunch at Elmer. I could have sat there for hours, just staring out to sea. Of course, if I had sat there for hours staring out to sea I would have become rather wet, for the tide was beginning to make its way back in. Time to go I suppose, albeit reluctantly. We made our way along the sands at the water’s edge, slowly veering back towards land as each small wave brought the tide in another inch. Eventually, the tide’s tendrils found little undulations in the beach and started to run inwards, forming shallow pools we had to navigate across. 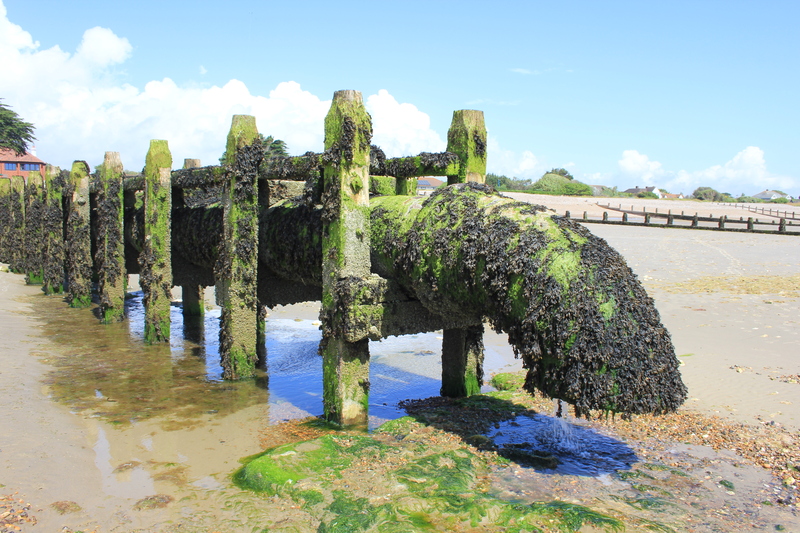 At one point, as we passed through Middleton-on-Sea, we found a giant tap – a water outlet of some sort, aged in seaweed. But wait! What was that monstrosity ahead? This was Butlins Holiday Camp at Bognor Regis, the outskirts of which we were now approaching. 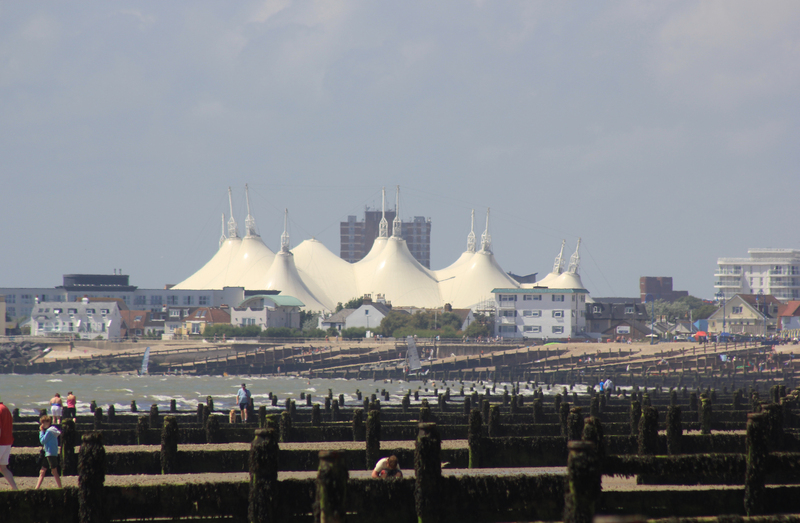 It dominated the skyline, the whole town even, like some form of sinister circus tent; the other buildings of Bognor cowered beneath it. I am pleased to say that by the time we reached it, it did not seem to dominate the skyline quite as much. The other buildings, although much smaller, blocked it from view when we walked alongside them. It is all a matter of perspective, but from here the perspective was not good. 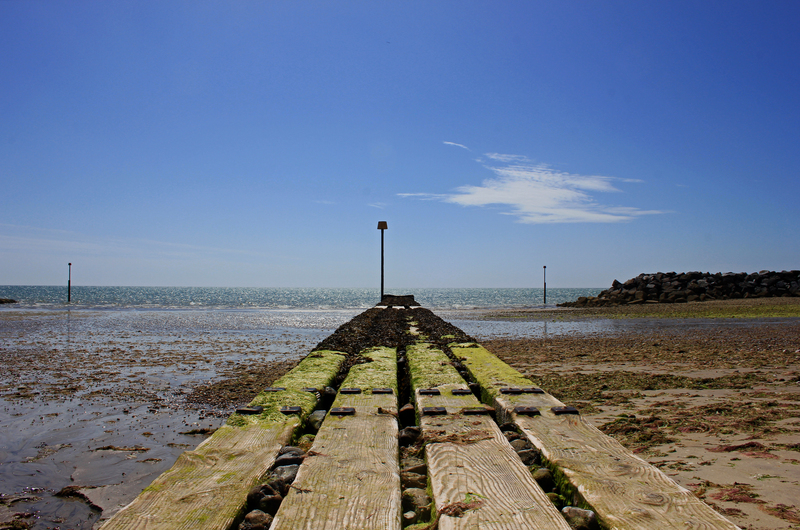 We carried on towards Felpham, after which we would reach the centre of Bognor Regis. This entry was posted in West Sussex and tagged bognor regis, butlins, coast, elmer, felpham, sea, travel, walking, west sussex. Bookmark the permalink. How could other buildings block *that* out?? ?